On my recent visit to London I spent the better part of two days cycling throughout the capital on a photo assignment. 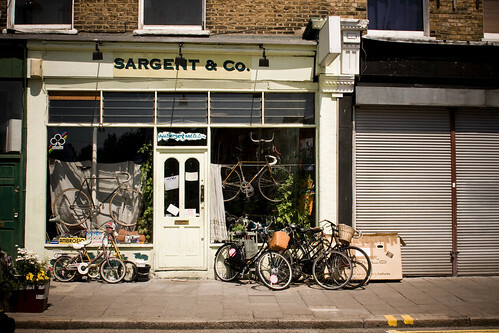 My indispensible guide, Oliver from Hackney Cyclists, brought me quite on purpose past Sargent & Co Bicycle Shop. My god, I'm glad he did. 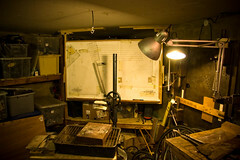 The shop was closed but Rob Sargent, the owner, was kind enough to open the door and let us in inside for a look. It was time for a tea break, anyway. 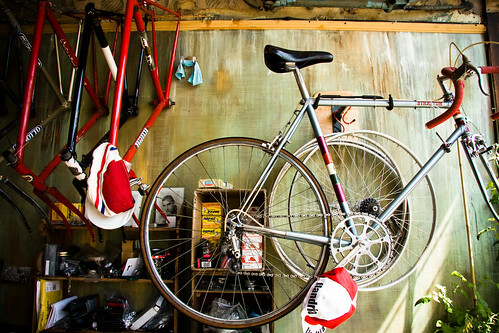 Rob opened up the shop about a year ago after settling on a bicycle shop as a 'lifestyle change'. It's more of a workshop than a bicycle shop proper as Rob gently restores vintage racers at the most relaxing, aesthetic pace. That's Rob making the tea in the background and it's Eric Deeks in the foreground. Eric is teaching Rob the tricks of the framebuilding trade. 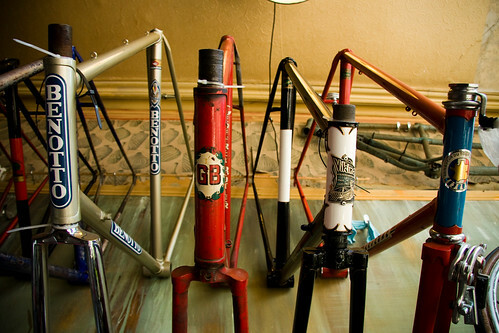 He used to build frames for Paris Cycles back in the day. I don't know what it was about the shop but I keep returning to it in my head. The atmosphere was calm, the air scented with the unmistakeable sweetness of oil and vintage. Buzzing gently below the surface was that unique passion for bicycles, like the sound of a distant bumble bee at the bottom of the garden. The most remarkable thing about this bicycle shop is that you feel as though it has occupied the premises since, I don't know... 1948... and that Rob's dad and grampy had puttered around inside throughout the decades before handing it down. You don't quite believe the Established 2008 sign outside and are quite convinced that the old walls have strained under the weight of hanging frames and wheels. Indeed, that they were built solely for this purpose. Speaking to Rob you are seduced by his quiet manner and gentle voice. 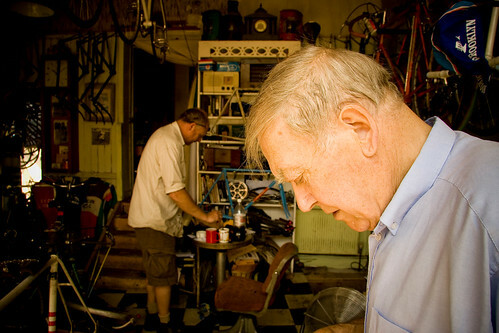 Just hearing the way he speaks and you know how he handles the old frames and bicycles that are wheeled into the shop. Gently, lovingly, passionately. Business is fine, apparently. Too fine, you sense. Meaning less time for the quiet pleasures of restoring old bicycles to former glory and building new frames. The bicycle in the left window in the top photo is Rob's first framebuilding effort. you can see a better photo of it on his Flickr Photostream. He was well proud about it in the most relaxed way. It certainly is a beauty. Eric used to build Paris bicycles not that far from the shop. His prescence in the place is one of quiet authority. Hands grey with grease as he sips his tea you can't help thinking of what it was like building bicycles in the 1950's and you secretly wish you were there to experience it. 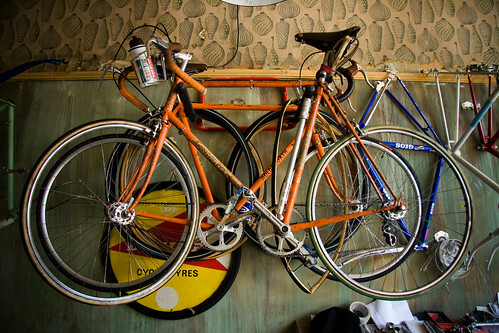 That's Rob's bike on the wall but he has a 'pub bike' out front which is just a beat up old mixte that nobody will nick. Left: An old R.H. Wakefield is on the rack, ready for treatment. If you're in London, be sure to meander past. Even if the shop is closed, peer through the windows. It's enough, somehow.